Serious Sam’s Bogus Detour is an all-new action-adventure in the legendary Serious Sam saga from Hammerwatch developer Crackshell. Serious Sam’s Bogus Detour is an all-new action-adventure in the legendary Serious Sam saga from Hammerwatch developer Crackshell. Battle through beautiful Mediterranean locales, dangerous biological weapons labs and even high-tech moon bases as a one-man wrecking crew or in four-player online cooperative for maximum chaos! Dominate the chaotic Survival and Versus modes or make your own mods, modes, and even total conversions with the included game editor. 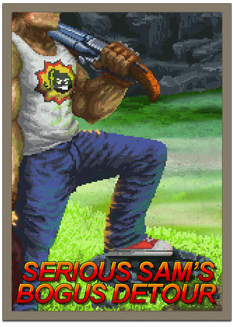 Serious Sam’s Bogus Detour is the biggest little Serious Sam game ever made!